3D drawing and overview of HARIM. We have built and are testing a system that will enable WHOI AUVs to perform adaptive survey based on real-time processing of sidescan acoustic and stereo optical imaging. 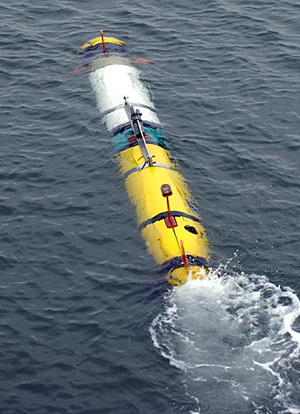 The Habitat Aware Reconnaissance and Imaging Module (HARIM) is a 3 foot long, 12.75 inch diameter system that is currently integrated and being tested on an existing REMUS 600 vehicle, though we expect it will also be applied to a number of WHOI AUVs. HARIM combines computing hardware and software to calculate a variety of data products in real-time (e.g., distributions of biological and man-made targets in relation to bathymetry and geomorphology, and habitat and seascape maps). Those results feed back to the vehicle’s mission planning system to allow adaptive sampling in patchy environments. 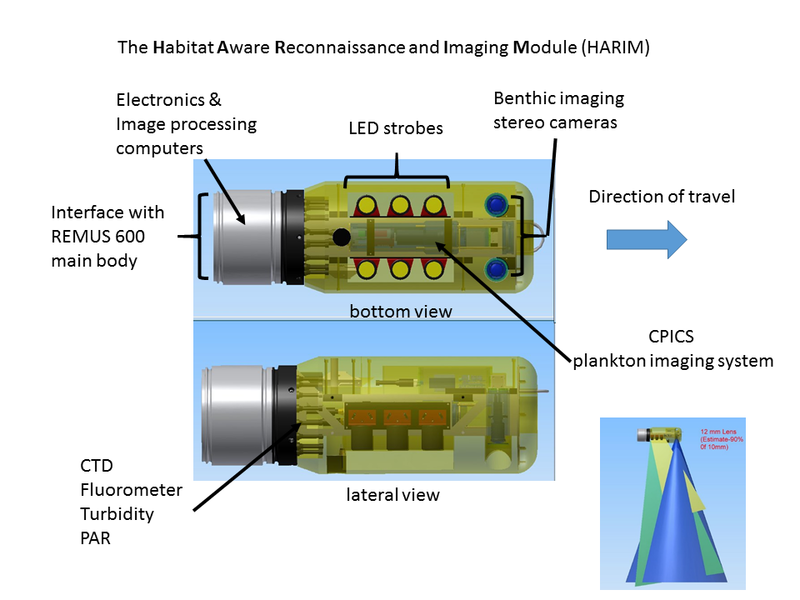 The HARIM module also integrates traditional oceanographic sensors (CT, optical backscatter, fluorometer, etc) as well as new sensors for biological (plankton imaging, chlorophyll, turbidity) and geochemical sensing (pH and DIC- sensor package in development at WHOI). These new capabilities will provide novel sampling and environmental characterization capabilities long sought after by biologists, geologists, physical and chemical oceanographers in a fully automated package. 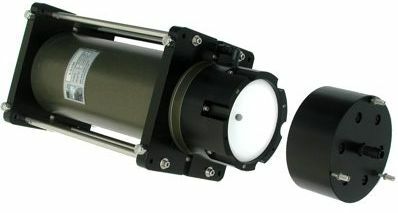 HARIM accommodates a stereo camera pair (8 Mpixel each), a LED lighting array, batteries, other biological sensors, and computational hardware to support image acquisition, processing, information extraction and data product production.